I struggle with worry. I used to think it was natural but worry is like a rash. It starts out small but, before you know it, it becomes an epidemic. And you still have the rash. 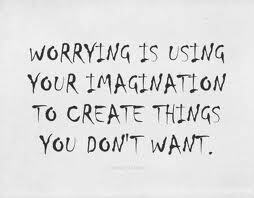 I’ve been thinking about what my worry has ever accomplished, and I have yet to come up with a single thing. I’ve worried about things that never happened. I’ve worried about things that happened in spite of worrying that they might happen, and I’ve failed to worry about things that happened that I never even considered. The one thing they have in common is that they all accomplished a big fat nothing. So I’ve decided it’s time for a change. I’ve never been one to make a New Year’s resolution because they’ve always seemed pointless and short-lived but I’ve decided it’s time I made a mid-year resolution. No one expects it, it seems more inspired, and hopefully it’ll be the beginning of a lasting and positive change. I’ve realized that I’ve always thought worry would lead to solving problems when in actual fact it’s concern that leads to solving problems. Concern mobilizes; worry paralyses. Believe me, I know the difference. So, whenever I catch myself worrying, I’m going to write down what I’m worried about and see if there’s anything I can do about it. If the answer is yes, then I’m going to write down what I’m going to do, and a deadline to do it, and then stop thinking about it. And, if the answer is no, I’m going to stop thinking about it. 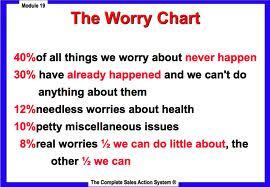 The Bible says that, as a person thinks, so is he (Proverbs 23:7) and I don’t want to be a worry-wart . So, to change my thinking, I’m going to focus on things that are positive instead. Happy things. Things that I’m thankful for. Things that I like. Things that encourage me. Listen to music that uplifts me. Surround myself with people that ground me, challenge me, and encourage me. All relatively small things that have the power to make a big difference. I just have to be intentional about it. Replace a bad habit with a better habit. I’ll not only be happier but I”ll be a real Joy to be around. I’m up to the challenge. Game on.